As a premier resort destination, La Paz possesses boundless natural resources and maintains an authentic small town ambiance that separates it from the more highly developed mega-resorts found throughout Mexico. La Paz is unspoiled, safe and inviting, providing relaxing strolls along its seaside waterfront amidst fiery sunsets. You can indulge in delicious local cuisine and dance until the wee hours. Or explore historic museums and shop for authentic Mexican arts and crafts. Try your luck and experience legendary sportfishing for marlin, wahoo, tuna, dorado and more. Snorkel with playful sea lions or scuba dive with hammerhead sharks and giant mantas. 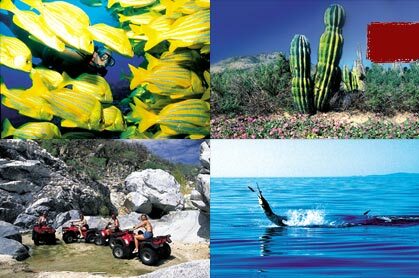 Kayak alongside friendly dolphins and whales or beachcomb in the tranquil bays of Espiritu Santo Island. Discover ancient cave paintings in distant canyons or venture into challeging mountain bike terrain. Or just relax and do nothing at all on an endless white sand beach and get reacquainted with your inner self. It's all here waiting for you in La Paz, Mexico. Includes: 2 Tank Dive at Isla Espiritu Santo with lunch, water, sodas and gear. Includes snorkelling gear, lunch, water and sodas. Includes: single kayak and life vest in the bay area.